The Butcher’s Daughter in Los Angeles! The Butcher’s Daughter claims to be a juice bar, cafe and a vegetable slaughterhouse. This restaurant treats fruits and vegetables like a butcher treats meat; they chop, fillet, and carve fresh produce into healthy and hearty dishes and also press them into juice. You feel healthier just walking into their airy, bright space, and you’ll likely feel the same way when you look at their instagram account! When I visited Los Angeles with my family, The Butcher’s Daughter was our first stop after leaving the airport upon arrival, and we needed some re-hydration and good food. Our flight had been delayed, and we were very late for our reservation, and hadn’t been in touch about it because we were on the airplane. There were 10 of us, and 3 in our group have various life-threatening food allergies, so we are not simple to accommodate (understatement!). My mother had connected with the restaurant once we were on our way, and even though we had lost our table hours ago, they really bent over backwards to get us all seated, even if at two separate tables, and served us, even keeping the kitchen open a few extra minutes from lunch. So many places would not have done this, and we were all very appreciative – and relieved! When approaching their location in Venice Beach on Abbott Kinney (they are also in New York City in 2 locations), my first impression was simply that it was a nondescript-looking brick building. Upon entering, I was greeted by a large fridge on my right displaying locally made kombucha and their juices made in-house and saw the restaurant space. It was bright and white with lots of wood and tons of greenery. I felt better already. We were seated at an island in the middle of the restaurant – a very similar structure to a bar, but without drinks being served (there was a bar too, but you have to be accompanied by someone over 21 to sit there). We all ordered something from their menu that made us happy and everyone was very pleased with their meals. I wouldn’t say it was the best food I’ve ever had, but eating and drinking in their space felt great, and ordering off a menu where eating nut-free or dairy-free or gluten-free or vegan is exciting, rather than boring. Their smoothies are interesting and delicious, as are their juices, available individually or as a flight. I highly recommend hanging out and enjoying the real food at The Butcher’s Daughter in Venice Beach. Note: Fala Bar is right across the street, and is fantastic for fast food take away, here’s my review. I ate there right afterwards, because I wasn’t going to be back in the neighbourhood, and had to try as much as possible for my own good and to share with you! Also, then visited Erewhon Market‘s new Venice location to shop (this place is the best market, an actual SUPERmarket!). 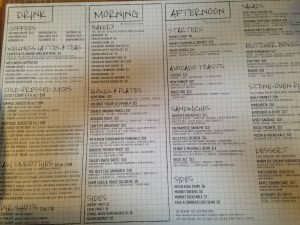 Huge Menu with something for everyone! You can’t tell from the front, but it’s a huge space indoors with a little open air patio out front and another garden patio in the back! My wrap, called the Surfer’s Breakfast packed with goodness including avocado, black bean mole, potatoes, salsa, and vegan sour cream. It was delicious. My friend Ryan very happy with his bowl! Pizza makes Andy very happy! Jaqs with her Juice Flight! Egg Sandwich with Adzuki Bean Bacon! All of us enjoying a delicious meal together!